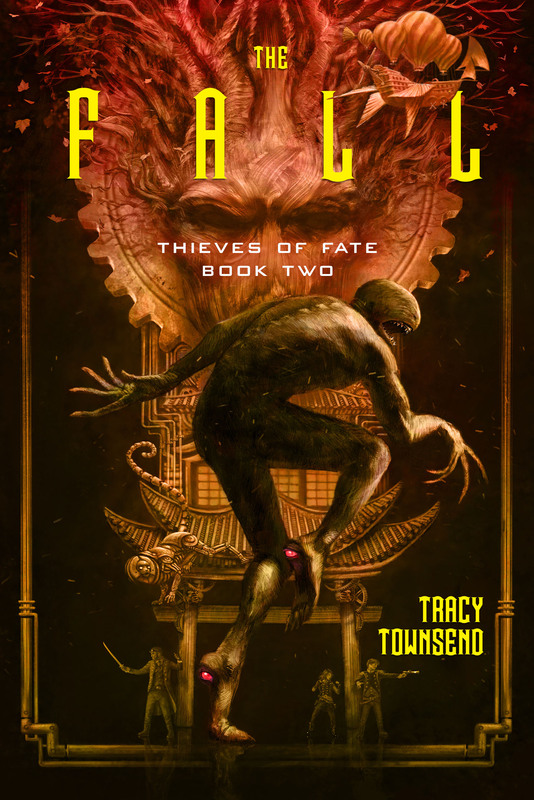 Last fall, Tracy Townsend’s debut fantasy The Nine, the first of the Thieves of Fate series from Pyr, brought readers a world of gaslamp intrigue, clockpunk technology, and deadly politics tangled up in scientific research and religious mythology. 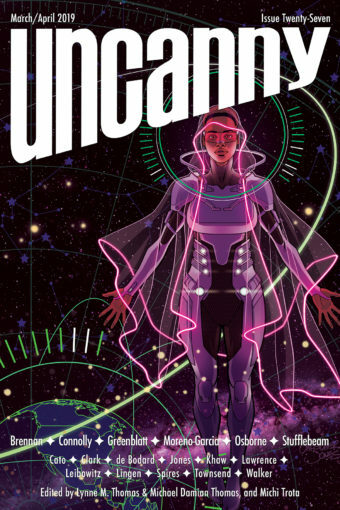 When a book that writes itself is revealed to be the key to the Creator’s Grand Experiment, forces beyond humanity take a keen interest in it and the nine subjects its data seems to track. The aigamuxa (a horrifying, ogre-like species with eyes in their feet and a thirst for vengeance against the humans that enslaved them) and the lanyani (sentient, mobile, murderous trees turned nomad by mass industrialization) mean to put their thumb on the Creator’s laboratory scales. The mysterious Alchemist, the notorious mercenary Anselm Meteron, and their light-fingered ward Rowena Downshire may be the only ones standing in their way. You can start 2019 off right by returning to the world of the Thieves of Fate in The Nine’s sequel The Fall! And great news, Space Unicorns! Today, we give you its stunning cover, with art by Adam S. Doyle, the plot blurb, a teaser from the book, and the pre-ordering information so you can get this novel when it is released on January 15, 2019! And now, THE COVER OF THE FALL! An apothecary clerk and her ex-mercenary allies travel across the world to discover a computing engine that leads to secrets she wasn’t meant to know–secrets that could destroy humanity. Eight months ago, Rowena Downshire was a half-starved black market courier darting through the shadows of Corma’s underside. Today, she’s a (mostly) respectable clerk in the Alchemist’s infamous apothecary shop, the Stone Scales, and certainly the last girl one would think qualified to carry the weight of the world on her shoulders a second time. Looks can be deceiving. When Anselm Meteron and the Alchemist receive an invitation to an old acquaintance’s ball–the Greatduke who financed their final, disastrous mercenary mission fourteen years earlier–they’re expecting blackmail, graft, or veiled threats related to the plot to steal the secrets of the Creator’s Grand Experiment. They aren’t expecting a job offer they can’t refuse or a trip halfway across the world to rendezvous with the scholar whose research threw their lives into tumult: the Reverend Doctor Phillip Chalmers. Escorting Chalmers to the Grand Library of Nippon with her mismatched mercenary family is just a grand adventure to Rowena until she discovers a powerful algebraic engine called the Aggregator. The Aggregator leads Rowena to questions about the Grand Experiment she was never meant to ask and answers she cannot be allowed to possess. With her reunited friends, Rowena must find a way to use the truths hidden in the Grand Library to disarm those who would hunt down the nine subjects of the Creator’s Grand Experiment, threatening to close the book on this world. Anselm introduced her to the curious and kind, and to the clearly dissembling, and in less than a quarter hour, his confidence made the words, “This is my niece, Rowena,” seem nearly true. Even Rowena could have believed it. In a way, she wanted to, as they took to the dance floor. Pre-order links for The Fall! A 9-feet tall bird-esque creature that’s very similar to a peacock, except the eyespots on their feathers are real eyes and independently sentient. A man sized duckbill platypus that walks upright.